This image is from several weeks ago. See the big white cornice in the corner? It is now painted! You can also see one new cedar shingle. I had to replace several that were missing or damaged. 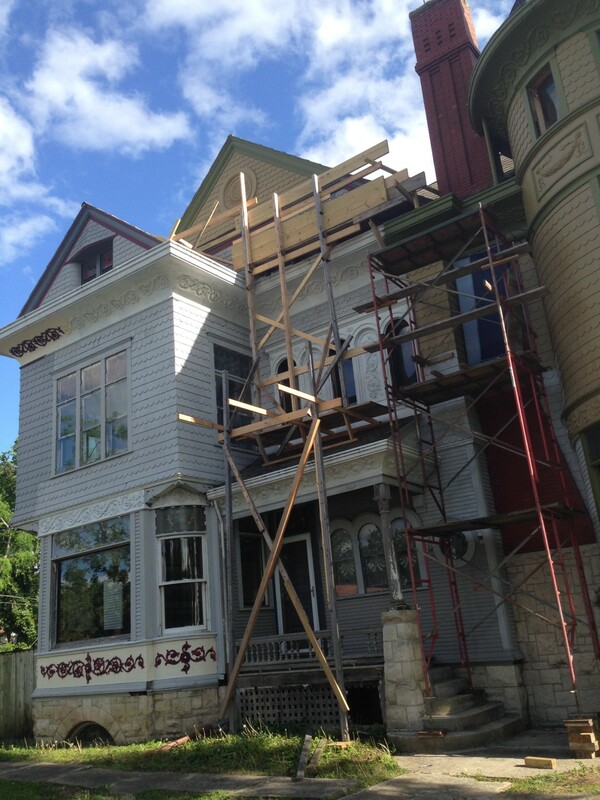 By next week, I will be able to remove this whole upper level of scaffolding. As I have previously mentioned, I LOVE SCAFFOLDING. I cannot imagine doing all this work from a T A L L scary ladder. The endless up/down alone would do me in. 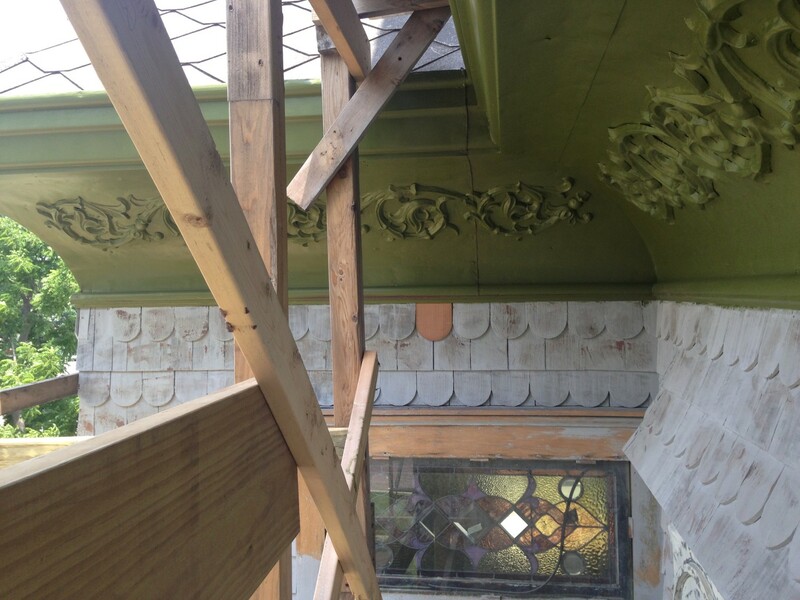 The scaffolding is rigid, and allows me the perfect, and comfortable, vantage point to work WAY up in the air. 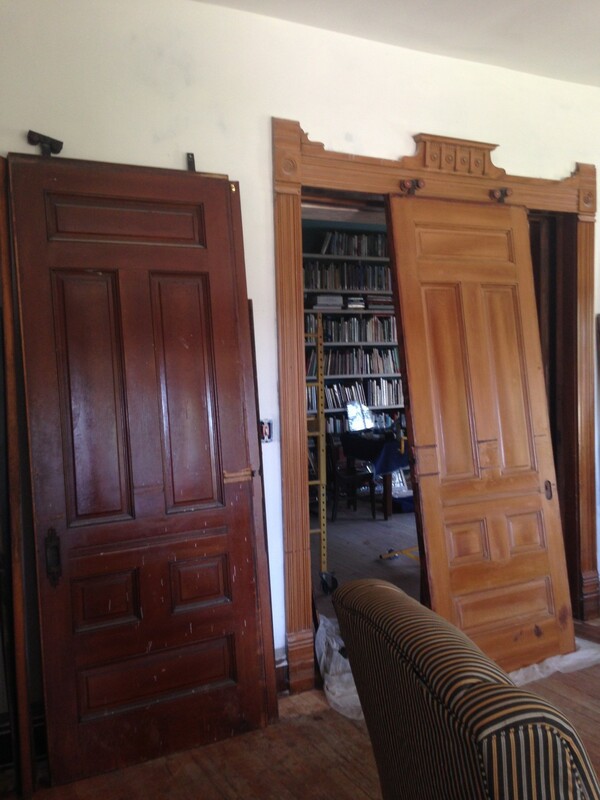 Meanwhile, down in the parlor, the pockets doors are slowly being refinished. Young Brian has been coming in on his own. We work different hours, and because I hardly ever see him, he is like a phantom. Brian wanted to learn refinishing, so I put him to work! The door on the right is now done, and you can appreciate how dramatically different it looks from its twin on the left, which still retains its aged shellac finish, hiding the original faux wood finish. The right door shows damage from being rubbed against something for a long time, and at the bottom it looks like a creature scratched against the door for a long time. A tiny dog? A rat? A mole person? Alas, nothing ages without scars; your door still looks beautiful! It could be that a servant carrying the afternoon tea tray may have used his foot to begin sliding the door open, then foot or elbow into the opening. backing in to open the door enough to get in. Doing this day after day for years would easily make such a mark. The horizontal marks are likely from rubbing against framing or something protruding from the framing inside the wall.Look inside with a flashlight and see if something is there. I haven’t read any posts beyond this one, so I may be suggesting something that you have already figured out.